If you live in a major city, chances are, your buses, trains, and trams are accessible to people with physical disabilities and special needs. Your elevators and sidewalks, too. What about your website? According to Forbes Magazine, people with disabilities represent the largest minority group there is — a $1 trillion market worldwide. To provide a comparative perspective, consider that the total market for cloud services in 2011 is only $91 billion according to Gartner. The overall market for consumer packaged goods (CPG) in the US, according to McKinsey, is only twice Forbes’ estimate, at $2 trillion; that’s every CPG in the entire country — mouthwash, paper towels, Tide, everything. People with disabilities use the Web in ways I call "smarter than the average bear." There are myriad assistive technologies out there that help solve this challenge. Before we look at usability testing for web accessibility, let’s first discuss how user testing is normally done so that you can have a better view of how user testing for accessibility is unique. If you have no experience in usability testing, I’ll give you a crash course now. In a usability test, the researchers watch as a user interacts with a product or website in order to find areas that aren’t user friendly. What you’re trying to understand in a basic usability test is this: Given a task, how many participants can efficiently and successfully complete them? For example, if a university wants to learn whether potential students can easily submit a request for a brochure on graduate programs, they might start by conducting usability tests to learn, quantitatively, how many potential students will be able to complete the task efficiently and successfully. Qualitatively, you can study the results for things you can do to optimize the potential student’s experience of finding a way on the website to accomplish this task. 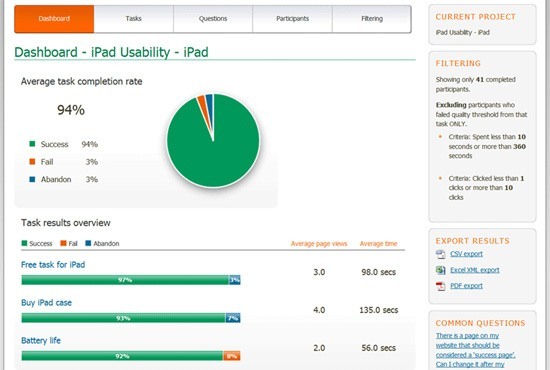 There are several different types of usability testing. Remote user testing is a form of usability testing where the tester moderates the test via phone, webcam, or an online tool, rather than being on-site with the user. This is often done with the users scattered across the country (or the world), and budget constraints dictate that the tester find alternatives to conducting in-person tests. Moderated user testing refers to research studies where there’s a live moderator spelling out the tasks the visitors needs to complete. In a face-to-face, moderated test scenario, the tester is typically monitored by a webcam or by live observers. Unmoderated user testing usually gives the user a simple prompt, leaving it up to them to figure out how to do what is prompted. Online user testing describes the use of a web-based tool (as compared to test participants sitting in a room that’s set up just for the test). Say you’re a usability tester. You might see a screen like the one below. This interface is specific to Loop11, my own user testing SaaS company. You can read more about this experiment here. Now that you know the basics on how user testing works, you’ll have a better appreciation of the unique set of barriers people with physical disabilities face when they are browsing the Web — a set of difficulties most of us probably haven’t thought much about. Below are some disabilities that can affect a person from experiencing the Web the way most people do. Motor disabilities: Like what an amputee might experience when he or she can’t use a traditional mouse, keyboard or touchscreen to interact with a web page. Visual impairments: This includes varying degrees and onset of the visual impairment, such as color blindness, low vision, and complete vision blindness. Cognitive impairments: E.g., traumatic brain injury, brain disease, and so forth. Hearing impairments: This includes varying degrees and onset of the impairment, such as complete deafness from birth or lower hearing capabilities developed as we age. For children and adults with autism, one familiar tool is TalkingTILES. It’s a touch-based application — what’s called an "Augmentative & Alternative Communication" (AAC) app — that runs on any major platform and any computer. The idea is to empower people with speech or language disorders to communicate with the world around them, and with computers, using symbols and visual words. When it comes to user testing, there are a few simple steps we can take to ensure that our site is, at the minimum, able to hook up with assistive technologies. This, in turn, removes common issues from our websites and allows us to focus our tests on things that we would normally have a difficult time discovering without user testing. 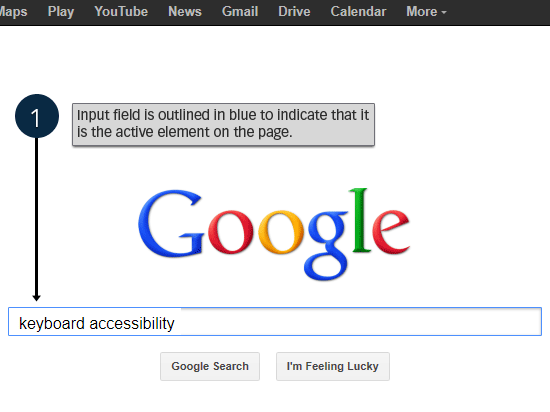 If a visitor is using a screen-reading assistive technology that interprets what’s being displayed on the computer screen (designed for visually impaired people), your web forms will be hard, if not impossible, for the person to interact with. Notice that the for attribute is important because it "links" the <label> element to the appropriate <input> element. Every component of your site must be navigable using only the keyboard. Some site visitors won’t have access to a mouse or touchpad, so your site should be accessible via keyboard-only navigation if needed. A rudimentary test: Use the Tab key to see if you can get to all hyperlinks and interactive elements such as links in drop-down menus, <input> elements, buttons, and so forth. Also, check to see if the currently active interactable element is highlighted and visible. 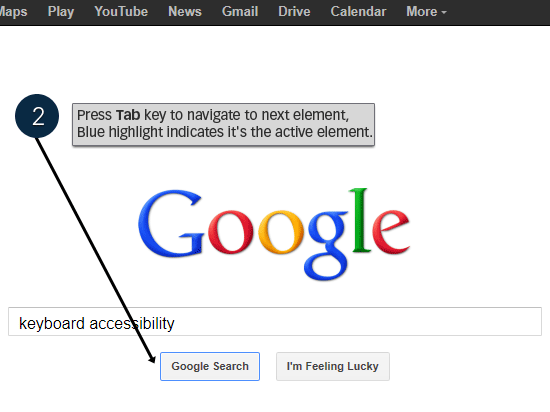 Below is the Google search page showing how good Tab key navigation works. The active/focused element is styled using CSS so that it is presented with a blue border. 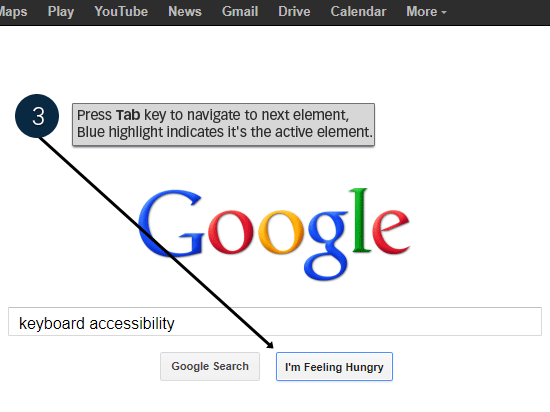 When you press the Tab key, it goes to the next HTML element. The blue border is removed from the previously active element and is transferred in the currently active HTML element. The styling and expected behavior is consistent. Images on your website that are critical to understanding the content being presented must have a useful alt attribute value to assist people that can’t see images. Of course, there’s always more you can do as a site owner and the above tips are only a few basic steps you can take to make your website more accessible for people. When we talk about accessibility user testing, we refer to a set of usability studies focused on users who rely on assistive technologies to access web content. The objective is usually to determine whether everyone, regardless of physical or cognitive impairments, can use a website. For a recent project, Knowbility, a non-profit dedicated to increasing technology accessibility, ran an accessibility assessment using our software. A screenshot of the Knowbility website home page. They recruited participants with special needs for accessing websites so that the researchers can determine what barriers the participants might face in browsing a particular university’s website. Some participants used assistive technologies like screen readers, screen magnifiers, and adaptive technology for motor impairments. Overall, the site tested could benefit from several improvements, though 6 of the 9 participants concluded the site was easy to use. Not a single participant thought it was difficult to keep track of their current location in the website. They all found navigation, on the whole, logical and well presented. The three main accessibility problems encountered had to do with keyboard use and screen-reader-accessibility. Dropdown menus weren’t accessible via keyboard, making them inaccessible for visually and motor-impaired participants. Keyboard focus issues were discovered: some interactive elements lit up as intended, while others didn’t. A lack of headings (e.g., <h1>, <h2>, and <h3>) made navigation tedious and time-consuming for those with audio screen readers. Instead of being able to skip sections of content that weren’t relevant, the participants’ only choice was to listen through entire pages of content until they heard the relevant item come up on the screen reader. These findings are often difficult to find without actual user testing. Because it’s one thing to know how to create accessible websites, but it’s another thing to actually witness how people with different abilities use a website. Can you navigate your site with a keyboard alone? Does your site use headings that are broken up easily enough for a screen reader to scan effectively? Are interactive elements adaptable to all audiences? 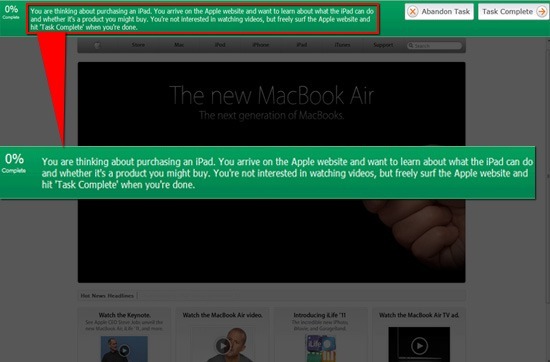 Are your links sufficiently distinguished for colorblind visitors? There certainly are a lot of considerations in the world of accessibility testing, though this shouldn’t deter web designers and user experience professionals from ensuring websites are built with universal design in mind. In 2012, I ran a joint webinar with the good people at Knowbility. You can view the webinar on YouTube and it’s embedded here below. To learn more about broader questions usability testers face, you can also check out my 7-series video called: Online Usability Testing 101. It’s free, but you’ll need to enter your email address.